Solving state and national budget woes is going to demand a painful set of decisions on where to carve out money — from public services, public safety, environmental protection? — no matter where legislators look. But an unlikely coalition of organizations, including the NAACP, ACLU and Grover Norquist&apos;s Americans for Tax Reform,* is rallying around a common target: Why, they ask, are we spending so much money on prisons? Over the last 40 years, America&apos;s inmate population has quadrupled, from 500,000 to 2.3 million, giving the U.S. 5 percent of the world&apos;s population, but 25 percent of its prisoners. The country now spends $70 billion a year — $50 billion of it at the state level — locking up all of these people, many of whom are nonviolent offenders snagged in the war on drugs. The budget crisis represents a kind of perverse opportunity for prison reform, and those rallying together behind the idea now include both fiscal conservatives and social justice advocates. The NAACP last week released a report calling for states to divert money from incarceration to education. Norquist stood alongside the group supporting the idea, and potential conservative president candidate Newt Gingrich is on board as well. "It&apos;s a sort of Catch-22, because we&apos;re happy that the report has received the attention it has, and we&apos;re happy that it&apos;s in the discussion at the state level around the budget," said Robert Rooks, director of the NAACP&apos;s criminal justice programs. "But we hope that if we were not in a crisis, some of the principles and ideas would still hold up." Since the war on drugs began in the early 1980s, spending on prisons has grown at six times the rate of spending on higher education. But the NAACP doesn&apos;t just want to point out misplaced priorities in comparing prisons to schools — it wants to draw attention to the intricate relationship between the two. Research has documented the impact of mass incarceration on destabilizing communities. "I was familiar with that work, and I knew we were going to uncover some pieces of that," Rooks said. "I have to say I was shocked when we started to see the strong connection between low-performing schools and high-incarceration communities." The report cites case studies of six cities, overlapping data on incarceration rates by zip code or census tract with statistics on school performance. 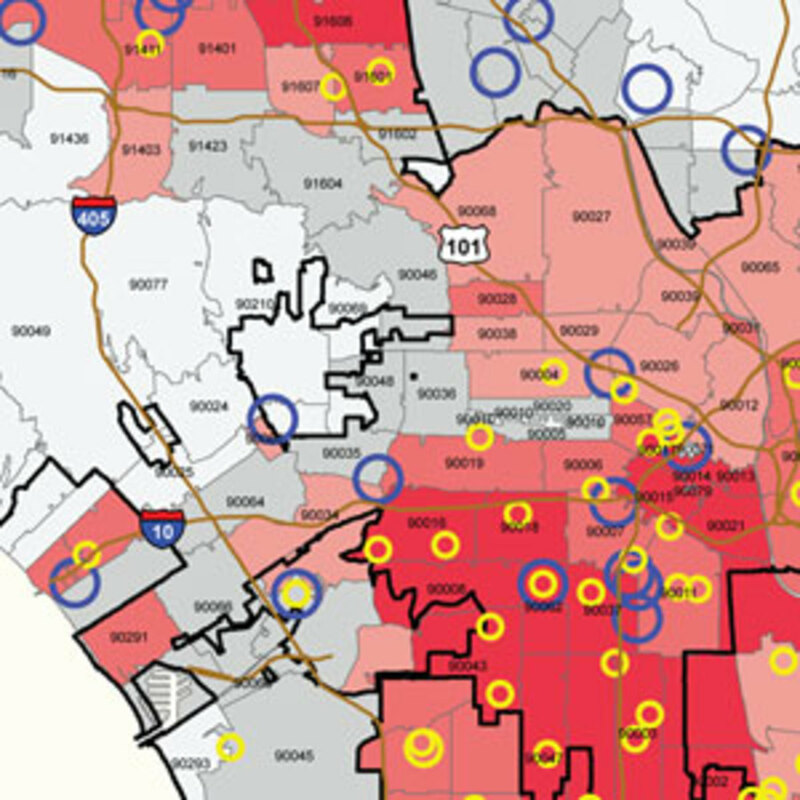 The correlation is strong: In Los Angeles, 67 percent of low-performing schools are located in neighborhoods with the highest incarceration rates (likewise, two-thirds of high-performing schools in L.A. are located in low-incarceration neighborhoods). The relationship between education and incarceration looks cyclical. Money diverted from schools leads to poor student outcomes and higher incarceration, and that higher incarceration demands ever more funding that might otherwise be spent on schools. The link isn&apos;t just theoretical. In many cases, schools and prisons literally draw from the same pot of money — state general funds, from which K-12 schools derive about 70 percent of their state funding, and prisons 90 percent, according to the report. This map details the Los Angeles County prison admissions per 1,000 adults by zip code of home residence. The graphic also shows the zip codes with high and low high school math proficiency rates. "If you look at general fund dollars and how they&apos;ve been spent over the last 20 years, you can see that as one goes up, one is going down around the same time," Rooks said. "We were not in those meetings to know if someone intentionally took dollars out of education and put it into prisons, but when you study the 20-year trend, it&apos;s so striking that you can bring attention to it, and then ask legislators to be accountable for it." For the NAACP, the issue is partly about reform of a criminal justice system that disproportionately touches minority communities (just by addressing why we incarcerate blacks and Latinos at a higher rate than whites for the same crimes, the report points out, we could cut the prison population and save billions of dollars). But the issue is, more broadly, also about tax-payer dollars ill spent — and that&apos;s why the conversation is timely now when so many other expensive policy proposals are not. If we engaged in education spending more efficiently outside of prisons, educational programs for existing inmates, and treatment alternatives for would-be inmates with mental health and drug abuse problems (who now comprise more than half of the existing prison population), there would be less need for prisons anyway. "What we&apos;re doing is we&apos;re redefining public safety for people, in terms of how we achieve and accomplish public safety," Rooks said. "In order to do that, we have to make sure everyone is represented, from the folks that used to talk about &apos;tough on crime,&apos; to the social justice people, to the fiscal people. It&apos;s going to take everyone because of the space public safety occupies for most Americans." * An earlier version of this story included the National Rifle Association as a partner in the coalition. While it was involved in early discussions, it was not part of the final lineup. Results of a survey from the American Association of School Administrators shows how K-12 school officials across the country made cuts to their schools' programs. What makes communities strong and vibrant? Researchers say local schools bring a raft of positives to town — even for the childless — beyond creating an educated populace.